In a state with so much wildlife and wilderness, there is one place that is legendary for a most extraordinary bear-viewing experience: McNeil River State Game Sanctuary and Refuge. 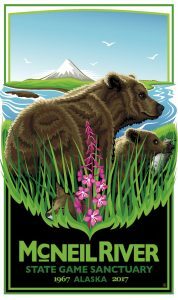 On the Alaska Peninsula, southwest of Anchorage, the State of Alaska set aside land that is known to be the most densely populated with brown bears in the world. At this sanctuary, you can stand right next to bear as they go about their normal behavior, unconcerned about human presence. The sanctuary is celebrating it’s 50th anniversary, so we invited in some experts who have spent the most time there to learn how this amazing opportunity came to be and what it’s like to spend time with the bears. Thanks to Liz O’Connell, with Frontier Scientists and Daniel Zatz for the fantastic video. Jeff Fair, Author of In Wild Trust. Larry Aumiller, former manager at McNeil River State Game Sanctuary. Tom Griffin, current onsite manager at McNeil River State Game Sanctuary.